Heavy-duty truck accommodates most cylinder tanks. Easily and safely carries 2 - 300 cu. foot tanks. 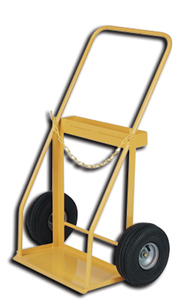 Includes heavy-duty holding chain and tool tray. Yellow in color. FOB Shipping Point. Product No. Caster Type Base Plate Size; O.A.H. W x D x H Wt. (lbs.) Price Ea.